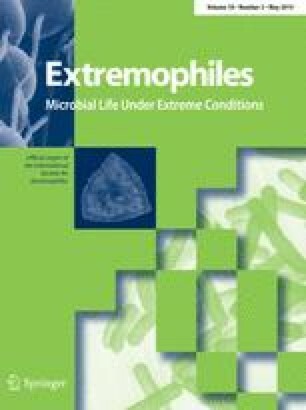 We investigated microbial life preserved in a hydrothermally inactive silica–barite chimney in comparison with an active barite chimney and sediment from the Loki’s Castle low-temperature venting area at the Arctic Mid-Ocean Ridge (AMOR) using lipid biomarkers. Carbon and sulfur isotopes were used to constrain possible metabolic pathways. Multiple sulfur (δ34S, ∆33S) isotopes on barite over a cross section of the extinct chimney range between 21.1 and 22.5 ‰ in δ34S, and between 0.020 and 0.034 ‰ in Δ33S, indicating direct precipitation from seawater. Biomarker distributions within two discrete zones of this silica–barite chimney indicate a considerable difference in abundance and diversity of microorganisms from the chimney exterior to the interior. Lipids in the active and inactive chimney barite and sediment were dominated by a range of 13C-depleted unsaturated and branched fatty acids with δ13C values between −39.7 and −26.7 ‰, indicating the presence of sulfur-oxidizing and sulfate-reducing bacteria. The majority of lipids (99.5 %) in the extinct chimney interior that experienced high temperatures were of archaeal origin. Unusual glycerol monoalkyl glycerol tetraethers (GMGT) with 0–4 rings were the dominant compounds suggesting the presence of mainly (hyper-) thermophilic archaea. Isoprenoid hydrocarbons with δ13C values as low as −46 ‰ also indicated the presence of methanogens and possibly methanotrophs. We would like to thank the crew and Rolf Birger Pedersen (cruise leader) onboard the R/V G.O. Sars during the cruises in 2009 and 2010 for their assistance at sea. Tamara Baumberger and Ingunn Hindenes Thorseth are thanked for precious help with sampling. We would also like to thank an anonymous reviewer for constructive comments that considerably improved the quality of the manuscript. This work was supported by the Swiss National Science Foundation (SNF projects 20MA21-115916 and 200020-132804) and by the EuroMARC programme of the European Science Foundation (ESF) through the ‘H2DEEP—Ultraslow spreading and hydrogen based deep biosphere’ project.